The Affilorama affiliate program is a platform teaching online marketers how to build a website and create content to promote a variety of products based on your topics. There are different ways to make money online and understanding how to do so can have a positive impact on your way of life. There are a lot of successful entrepreneurs that have taken the rout of establishing an online business. There are a few top notch programs out there that provides the tools and training to help people with there goals of making money online. While Wealthy Affiliates is my number 1 recommendation for Grade A training for affiliate marketers, Affilorama stacks up as a decent platform to learn as well. Before getting into a comparison of the two I will provide a review of the Affilorama affiliate program. Mark Ling is the founder of Affilorama and he started the program in 2005. He has a lot of experience and success as an affiliate marketer and his training is designed to help people aspiring to do the same. You can join Affilorama for free as there are great training videos provided, and you will also have access to the members forum where you can ask questions to more experienced marketers. However if you are serious about learning how to build a successful business online it would be in your best interest to go premium. There are other products sold separately as well to help build your online business. The products sold are the AffilioTools, AffilioBlueprint, and Affilio Jetpack. The AffilioTools is designed to track stats as far as traffic to your site, how your keywords rank vs competitors, and it is even designed to help build a following on social media platforms such as facebook and twitter. AffilioTools can be accessed for free or you can upgrade it at $17 a month for a bronze package, $47 a month for a silver package, and $97 a month for a gold package. 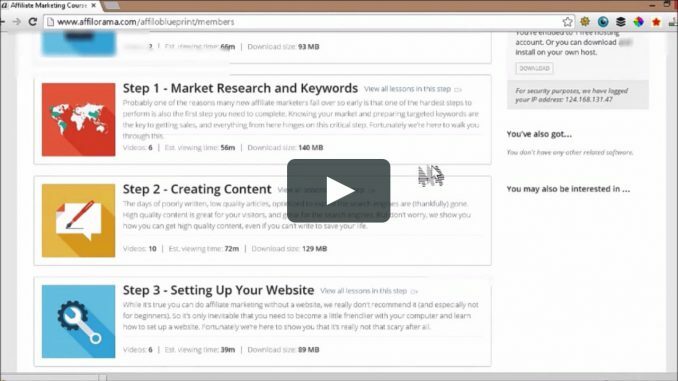 The AffilioBlueprint is confusing to explain because it is a step-by-step “how to” course that will show you how to build money-making websites but you should be getting such training as a premium member. It cost $197 and includes a month trial of premium membership. I would not recommended to get this product. The AffilioJetPack is designed to put marketers on the fast track to success through teachings of email marketing. The Affilio JetPack also chooses a topic and create content for the niche. It is priced at $997 and sounds like a get rich quick scheme. As far as I’m concerned the only worthwhile service Affilorama offers is through their premium membership. While Affilorama offers products to help build your business along with the premium membership, you will learn everything you need to know with the premium membership at Wealthy Affiliates. From Email marketing, to tracking stats for your traffic, and learning how to use social media to enhance your business. Wealthy Affiliates premium membership is priced at $19 for the first month and then $49 after which makes it less expensive to build and maintain your online business opposed to the Affilorama Affiliate program which is priced at $1 for the first month and then $67 monthly. Both programs offer a free membership with training videos so beginners can learn about affiliate marketing. The members forum within WA is much more active as there are incentives to helping other members. WA feels like a facebook community of online entrepreneurs that are always willing to help each other in their endeavors. The members forum within Affilorama is stale compared to Wealthy Affiliate which has thousands of active members, and a live chat scrolling 24/7 where you can ask questions and get instant answers. Are you looking all day long for information on how to make money online. Are you willing to put in all the effort it takes to build a successful online business. When it comes down to the choices we make, establishing a passive income through an online business can change your way of life for the better. You will be guided every step of the way in your quest to join in on the success many people experience through making money online. Perform all the tasks necessary from the courses provided and you will be on your way to accomplishing online success. In making such a decision it is always best to learn through a credible program such as Affiliorama, but if you decide to establish an online business Wealthy Affiliate would be my number 1 recommendation. Affilorama sounds like it offers good training, but I never like the idea of joining a program, and then have to pay extra for other training materials. On the other hand, Wealthy Affiliate really offer a far better package. I am glad I found them and joined the program almost a year now. No doubt they are the best with cost and online training these days. I don’t like that idea as well and it seems as if they do so to maximize profits. It would also be a blow to come into something where the members forum is not very active. I was a member of Affilorama years and years ago including having the AffilioJetPack (AJP). Back in the day, it was not so costly. Mark Ling’s training is very good. And the AJP was a good deal because it shortened the website development time. While I can’t comment on the current Affilorama program as compared to Wealthy Affiliate, WA training is much better for the novice. The WA website hosting is probably one of the best around. It is great that you joined Wealthy Affiliate. I would say that it has taught me a lot and I am starting to enjoy the benefits from putting in all the hard work. While Affilorama seems like a good opportunity it is always good to go with the best.